I've joined a breakfast event at Bangor University’s Reichel Hall today. I'm here with all the various individuals and agencies that are involved in the valuable work that's taking place to maximize the social and economic potential of Anglesey and Gwynedd. As the nuclear power stations in Trawsfynydd and Wylfa reach the end of their lives, there are social and economic challenges posed by decommissioning on communities in Meirionnydd and Anglesey. The challenges have long been acknowledged on a local and national level. Most recently, areas around both power stations have been designated as Enterprise Zones by the Welsh Government bringing special attention and effort to secure their economic future. This has led to much work over recent years to tackle these challenges. Over the last 5 years, Gwynedd Council and the Isle of Anglesey County Council, alongside the Welsh Government, have been working in partnership with the NDA and its Site Licence Company, Magnox Ltd, to take action to secure a prosperous future for Meirionnydd, Anglesey and north-west Wales. NDA and Magnox Ltd have supported all the efforts to mitigate the impacts of decommissioning on local communities. It is a really important part of the NDA’s remit. 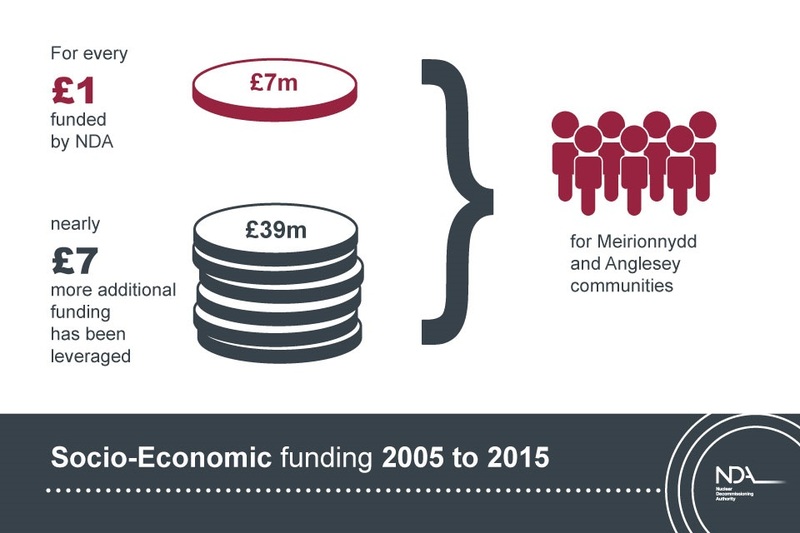 Our investment of more than £7m over the last 10 years has levered an additional £39m. All this funding is helping create new jobs, new training opportunities and improve infrastructure in North West Wales. Socio-Economic-funding for Meirionnydd-and-Anglesey 2005 to 2015: NDA and Magnox Ltd investment of more than £7m has levered an additional £39m. The results of these projects so far are extremely encouraging. We are are looking forward to continuing to work with Gwynedd Council, Isle of Anglesey County Council and other organisations...so that we can build on this success and pave the way to a more diverse and resilient economy in Anglesey and Merionnydd. These projects should secure a diverse and sustainable economic future for Meirionydd and Anglesey.